The Huracan has been with us for a few months now and Lamborghini have already readied a track rendition of their newest supercar. The 2015 Lamborghini Huracan Super Trofeo will be the successor to the highly acclaimed Gallardo LP 570-4 Super Trofeo. 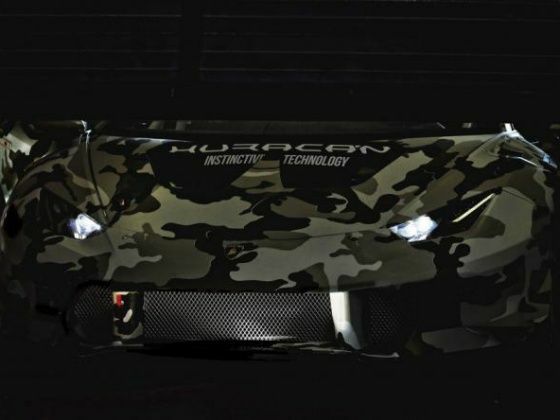 Lamborghini have teased an image of the Huracan LP 610-4 Super Trofeo in a cool camouflage themed wrap showcasing some of the aero advances the race car will make. The track version of the Huracan will feature the same 5.2-litre, naturally aspirated, V10 engine that makes 610PS. However, the Huracan Super Trofeo will be wrapped around in a lighter and more aerodynamic body, which will make the car much faster around corners. Aero aids will include a completely redesigned front end with a built in splitter arrangement for more downforce. The front will also adopt a larger intake for better cooling for both the brakes and the radiators. The Lamborghini Huracan LP610-4 will also feature a large rear wing and a rear diffuser to improve rear end down force to help keep the car planted on the track. The aero enhancements combined with the stripped out interior and the stiffer adjustable suspension and slick tyres will make the Super Trofeo much faster than the street car on the track even though it has the same 610PS power rating. Set to compete in next year's Blancpain Super Trofeo series, the race-spec Huracan will be seen alongside the outgoing Gallardo Super Trofeo as Lamborghini has announced existing owners of the Gallardo ST will still be able to use their cars. However, the Gallardo and Huracan Super Trofeo models will compete in different classes. The race car will soon inspire lighter, more powerful versions of the Huracan for the street too. With the Spyder due anytime soon and the Superlegerra post that, there will also be a Super Trofeo Stradale edition available in limited numbers for select buyers worldwide.